It appears something significant is on the horizon for Days Gone. PlayStation Spain has sent a number of Spanish news outlets invites for a special occasion, which is scheduled to take place on February 13, 2019. Interestingly, these invites are in the form of wedding invitations for Days Gone protagonist Deacon St. John and Sarah, Deacon’s bride-to-be. Presently, it remains unclear as to what PlayStation Spain has planned. Perhaps the wedding motif means story details about Deacon’s past will be unveiled in a brand-new trailer? Whatever the special occasion is, it’ll be featured on PlayStation Spain’s YouTube channel. Those interested in seeing things unfold live can tune in at 2 pm GMT/8 am CST on February 13th. At the time of writing, none of PlayStation’s English Twitter accounts have shared the news. However, fans the world over may still want to keep an eye out. It’s not uncommon for a special event geared towards a specific global market to announce details that affect fans worldwide. Of course, this happens most notably with English-speaking events, but a Mortal Kombat 11 livestream in Brazil was the first anyone had heard of Kano’s being added to the roster. 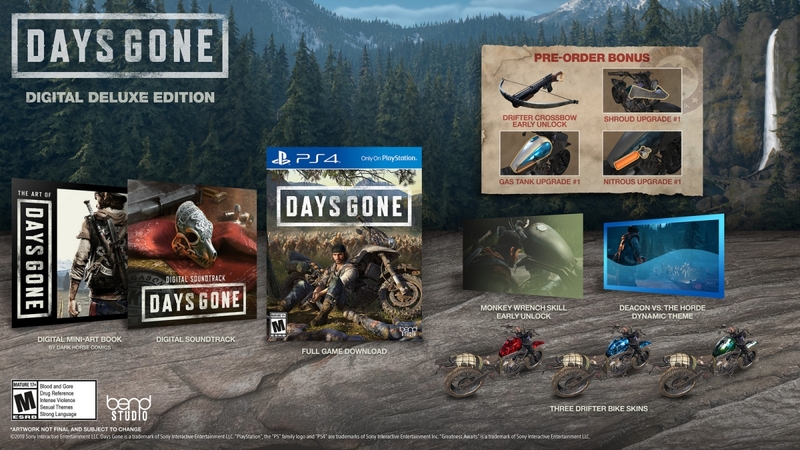 Days Gone will come to the PlayStation 4 this spring on April 26, 2019. Fans willing to spend a little more can choose from two special editions to pick up, as well.